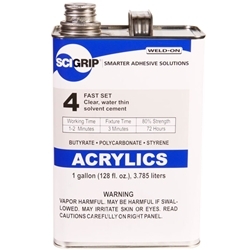 Water thin, somewhat flammable, moderately fast-setting, blush-resistant solvent cement for bonding acrylic. It will also bond with other thermoplastics such as polystyrene, CAB (cellulose acetate butyrate), and polycarbonate to themselves. It will not bond to cross-linked acrylic. THIS PRODUCT IS FOR INDUSTRIAL USE ONLY AND NOT FOR CONSUMER USE AT HOMES OR SCHOOLS OR IN RECREATION.